Happy New Year! Yes, I know I'm a few days late but I've been more than a little distracted from my humble blog lately. And by lately, I meant to say at least a year or so. 2016 was a year of soul searching, but not in an earth shattering, mind-melting sort of way. Rather, the voice in my head began to sound something like this, "What are you doing with your life? ", "When are you going to do something that actually matters? ", and "You DO realize that your life is probably half over, don't you?" The standard good things apply as a credit. I have wonderful children, which may or may not be a credit to me. They are amazing people. While I do like to think that I've had something to do with that, they are their own entities and not my complete creation and property. I have a successful small business. It hasn't made me wealthy, but it pays my bills. I have my health. I'm creative. I have amazing friends and family. I'm blessed beyond measure. So Why Do I Feel Like I'm Dying Inside? It wasn't enough. All the blessings and goodness didn't make me feel complete. I had started a novel in 2012. It seemed frivolous, impossible even, something meant for other people, but not for someone like me (untalented and average). At first, the words typed on my screen were simply an escape from the frustration of an unhealthy relationship. They were my way of coping. I couldn't lash out, so I twisted my feelings into imaginary characters and situations. I continued to go back to the story, and it took on a life of its own. The story changed and grew along with me. The day that I knew my marriage was over, I walked out the door with our two youngest children, my outdated laptop with little on it but my unfinished story, and the clothing on our backs. And then, I pushed it aside for the rest of 2014 and most of 2015, while I focused on rebuilding my life. My story sat untouched, almost forgotten. The characters continued to live on in my head. At the risk of sounding like a crazy lady, the characters still told me their stories. My "day job" as a cleaning service affords me plenty of time alone to think while I'm working. I love the quite time while making my clients' homes and offices sparkly and tidy! I found that once the chaos of the divorce was over, and a peaceful co-parenting situation was established, my creativity began to flow. I needed to write again. If I wasn't writing, I was cranky and discontent. Of course, like so many of many of us experience whenever we strike out to accomplish anything exceptional, the negative inner voices started to nip and nag. In 2016, I became painfully aware of the self-defeating attitudes that had plagued me my entire life. I secretly felt that I was doomed for mediocrity. I know that I am a hard worker. But I was sure that there was some secret sign on my forehead, written in invisible ink, designating to the powers that be to exclude me from any real greatness - a rev limiter of sorts. I had a sinking feeling that the game was rigged. On top of that stinky attitude was the fear that I'd grown too old to accomplish anything of real value. I'm not sure what changed my thought process. I honestly don't know. But somewhere in the beginning of 2016, I began to write affirmations (the same five affirmations) each night before bed and every morning upon waking. I wrote the affirmations as if they were already true. The affirmations are very specific. And I began to think, "Why not me?" Then, I finished the first draft of my manuscript. Is my book completely finished? Not yet. But, I have had a group of beta readers give very valuable and positive feedback. The book has also been edited. Now, it is in the process of the final rewrite. That would definitely NOT have happened had I continued to think in the same old self defeating terms as before. After all, if something is doomed to fail, why bother finishing it? There is Magic in Our Thoughts! Unfortunately, my children have been exposed to my limited thinking and my fearful perspective. I pray that I am setting a good example now. I had a fun, spontaneous idea on New Year's day to get our entire family to start thinking about our goals and "wants" for the year of 2017. We all wrote on a small slip of paper a few things that we want from our year. The only requirements were that the goals or wants must be positive (no wishing harm on another), worded as if they have already occurred (for example, "I am a New York Best Selling Author 2017"), and we must be thankful for them. We all placed our papers in the "Magic Jar" and sealed it. After midnight 2018, we will open the Magic Jar and reflect on how our year has been blessed. 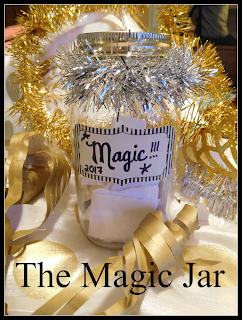 My hope is that the Magic Jar is just the beginning of a lifetime of positive attitudes and believing in the impossible. Eventually, they, like their mother, will realize that the magic lies within. 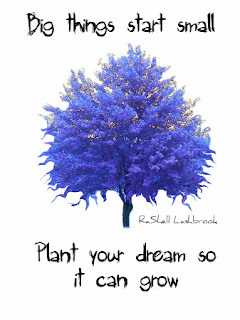 Remember the Universal law of creation: Want it, allow it and it will happen. It all starts with positive thought! Believe for 2017! I'm so excited for all of the wonderful things coming our way in 2017!Thanks for the positive energy!